I had played with sourdough off and on, most recently getting some from Stuart Silverstein after attending his workshop on earth ovens. I used his starter for a while, but had a hard time adapting it to no knead bread making, which at that time was all I was doing. Eventually, I gave up, but this past Christmas, my wife gave me a sourdough starter from King Arthur flour, so I had to figure out how to make a good sourdough bread. I was underwhelmed by King Arthur’s version of sourdough bread…it looked good, but was not sour enough and the crumb came out too much like supermarket bread. I again tried adapting sour dough to my no knead technique, and while I thought it tasted good, my family thought it was too tart. The bread also was very dense, and texturally had more in common with masonry then bread. I am still not sure why this kept failing, but after subjecting my parents who were visiting over the holidays to several loafs that looked like Frisbees, I scrapped the idea of a no knead technique. I decided to try the more traditional kneading and rise times to develop the gluten yet limit the time the bacteria have to work on the dough, thus decreasing the sourness. With this new plan, my criteria were that the bread had to be leavened by the the sourdough, no other yeast. 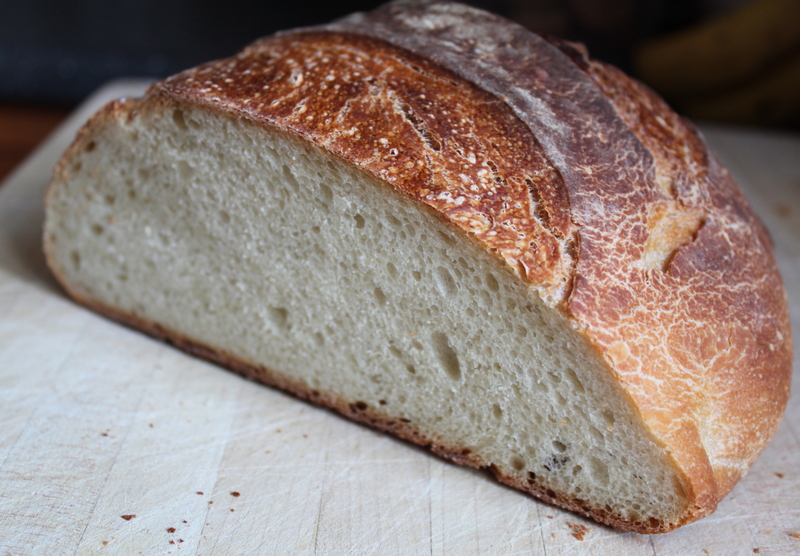 The dough had to be cooked in a pot to give it that great, chewy, crunchy crust, and the crumb had to be soft, but still have a good chew and a nice sourdough tang. After some experimentation, I stripped it down to this basic recipe below. Please note, I use a kitchen scale for the flour measurements. Step 1: Make the fed starter. I do this by taking 1/2 a cup of the sourdough starter I keep in my fridge, and put it in a non-reactive bowl with 1/2 cup of all purpose flour and 1/4 cup of bottled or filtered water. I try to use dechlorinated water in my starters, to keep the bacteria healthy. I mix this together, cover the bowl in plastic wrap, and let it sit overnight. When it is ready, it will be very bubbly. 2. 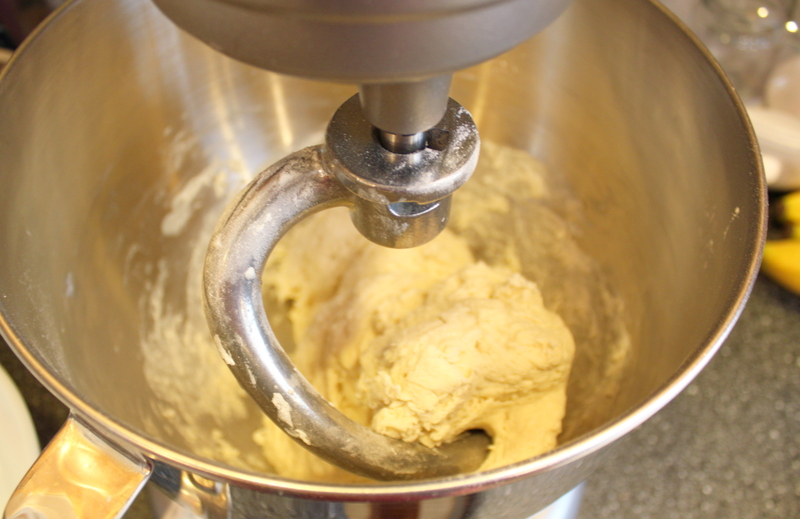 Using a mixer equipped with a dough hook, combined the starter with the room temp bottled water, to make a slurry, then add the sugar, and slowly feed in the flour as the dough hook is kneading. I have a Kitchenaid Mixer, and use it set at level 1. As the dough comes together, I added the salt, and let the whole thing mix for about 4-5 minutes. 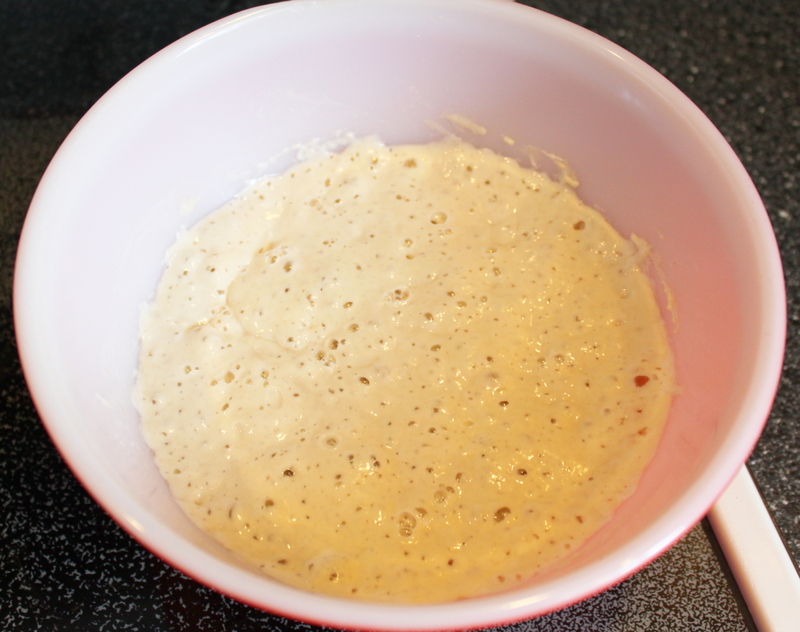 The dough initially breaks and tears, looking kind of clumpy, but as it mixes it will start to stretch and you will not see the dough tear, this is the gluten being developed. 3. 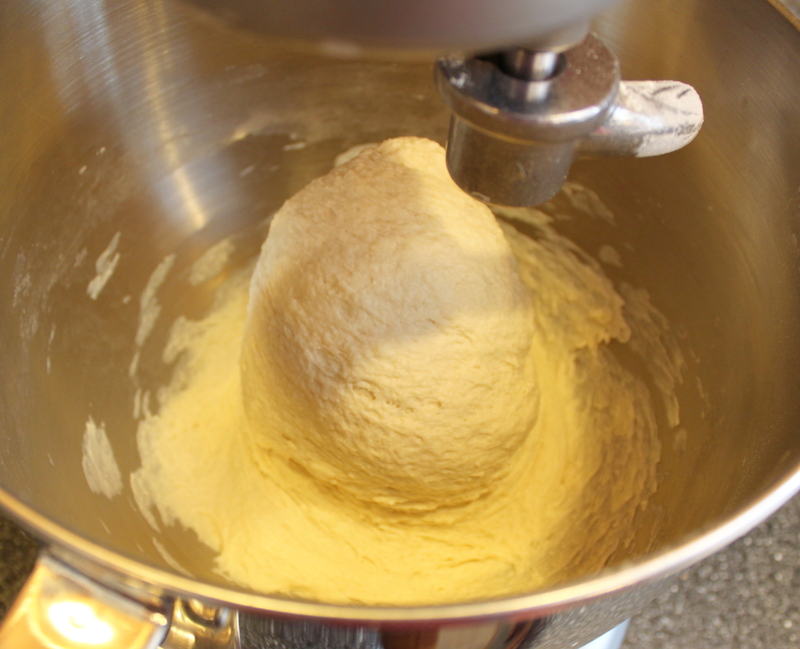 After you are done kneading, the dough is transferred to an oiled glass bowl or other non-reactive bowl. Covered this with plastic wrap, and let it rise in a warm area for about 4-5 hours, in which time it will more then double. 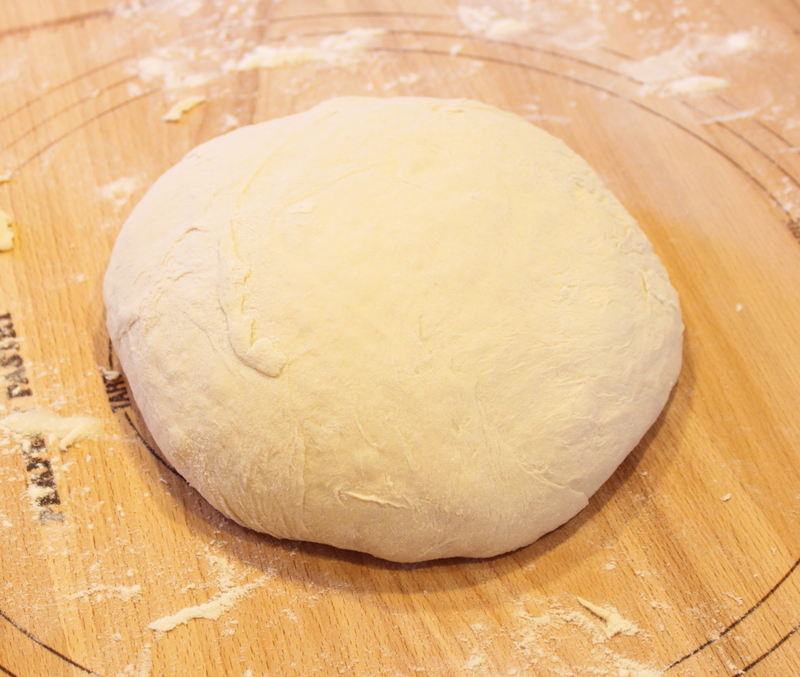 Step 4: Turn the dough out onto a floured surface, kneaded it a few times, and shape it into a ball. 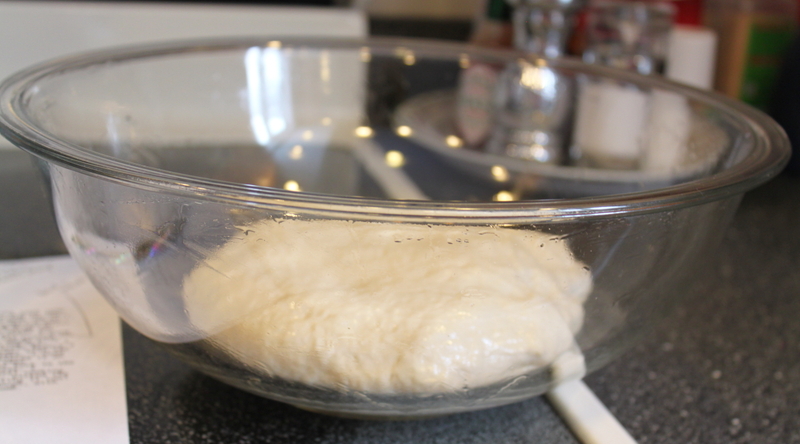 Using a piece of parchment paper sprayed with cooking spray to line a bowl, place the dough in the bowl, on top of the paper. 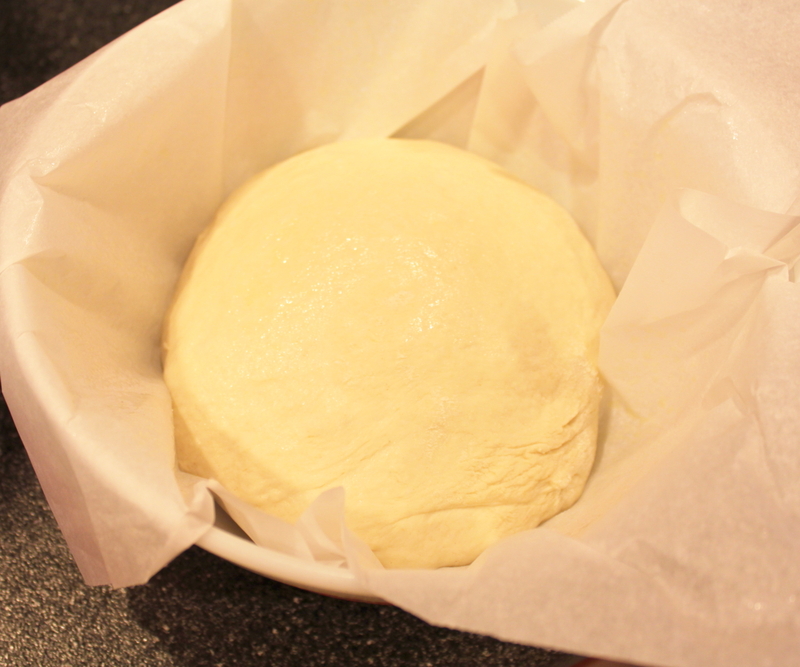 Sprayed the top of the dough with cooking spray, and cover with plastic wrap to keep the dough from drying out. Let the dough rise until doubled again, about 90 minutes. About 45 minutes into the second rise, place your pot with its lid in the oven and let it warm to 450F. I use my large cast iron Dutch oven. The purpose of the bowl is to help give the shape to the final loaf. If you want oval loafs, or baguettes, you can form them at this stage and let them rise. I would put them on oiled parchment either way, as it just makes it easy to move the dough/loaf around later. What ever shape, just make sure it fits into your pot. I would also oil them and cover them with plastic wrap so they don’t dry out too much on the crust as they rise. 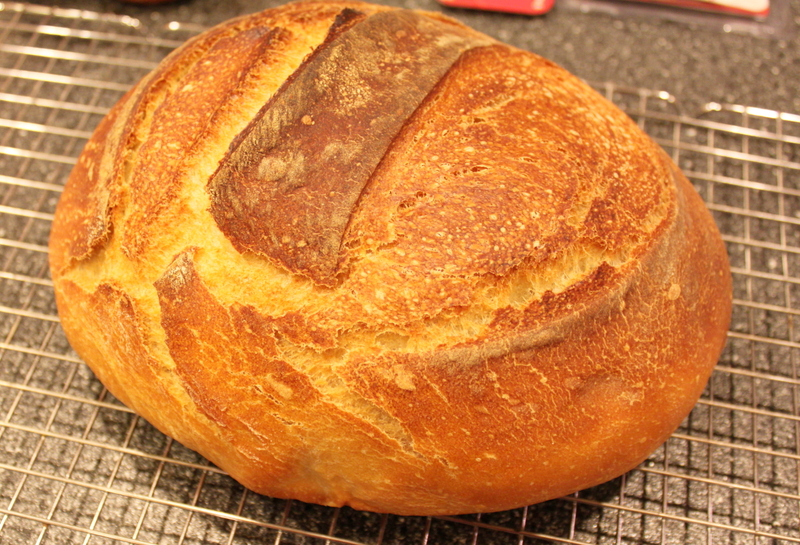 I like to use a bowl with steep sides, as it helps to give a taller final loaf. I have read about Romertopf clay bakers for baguettes. I have read good things about them, but I have never used them, so do your own research. 5. 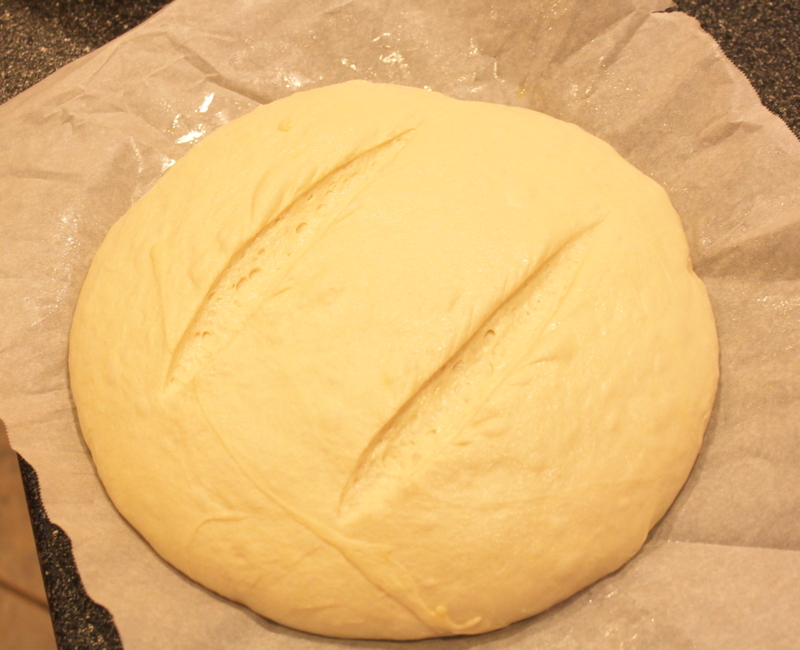 After the dough has doubled in the 2nd rise, use the parchment paper lining the bowl to act like a sling, and pick the dough up out of the bowl. I will put it briefly on the counter, make a slash or two quickly with a serrated bread knife, and then, using the paper, lower the whole thing into the hot pot, put on the lid. Put the whole pot back in the oven, and turn it down to 425F. After 30 minutes, take off the lid, and let the bread bake another 20 minutes, for a total cooking time of 50 minutes. You can check the bread by using an instant read thermometer. Bread is done baking when it is 205F in the center. If you are doing smaller breads, your time will vary, so you will have to play with it. If you are doing baguettes, I would start with a 20 minute bake time with the lid on, then 15 minutes off, and go from there. You can control the browning of the bread by when you take the lid off, so that is another variable you can play with. 6. After the bread is done done baking, take the pot out of the oven, use the parchment to lift the loaf out of the hot pot, and put it on a rack to cool for at least 2 hours. You don’t want the middle of your loaf to still be hot when you cut into it, as the crumb is not really set until it cools. Next slice or tear up your bread, and enjoy. I have found that the loaf is good even 3 days later. I keep my loaf out, on the cutting board, cut side down to help keep it from drying out. The bread never lasts long enough for me to explore what to do with the stale bread.